Inbound marketing is the concept of earning the attention and business of prospects and customers through the development of unique content. That can include blogs, videos, enewsletters, SEO, social media, etc. Creating quality content is hard work, and there is no perfect solution or magic formula, so what works for one company may not work for another. Watch this webinar to learn some best practices that can help you focus on creating successful content and maximize the reach, value and return on your efforts. Mack McGee: All right, all right. Good afternoon, everybody. I’m Mack McGee from Groove Commerce. I want to thank you all and welcome you as we kick of the 2013 Groove Webinar series. Got a great topic today, and I think you all have clearly shown that you’ve found it interesting as well because we’ve got a huge audience for today’s webinar and a lot of new people here. We’re talking about what is inbound marketing? So we’re going to discuss today how you find an online strategy that’s going to help generate more business from your online presence. We’ve got some great content queued up for you today. Very excited to share it. But, first and foremost, with such a large audience, we want to welcome everybody to the Groove Commerce webinar series. To those of you who are coming back, welcome back. And to those of you who are joining for the first time, really want to thank you for taking time out of your day this afternoon to spend some time and learn a little bit more about inbound marketing today. Again, couldn’t be more excited about the content that Ethan’s queued up. And so, with that, let me introduce, as always, our host, CEO & Founder of Groove Commerce, Ethan Giffin. Ethan Giffin: Hey, Mack. How you doing today? Ethan: Excited to be here. Mack: Good stuff. I’m Mack McGee. I’m VP of Sales and Marketing here at Groove Commerce. Excited to serve as today’s moderator as we make our way through a very exciting and sometimes intimidating conversation, which is defining an inbound marketing strategy. Today we’re going to define not only what is inbound marketing, but walk you through the key pieces that we’re working with clients to really make your online presence successful and really define how you generate the ROI you are looking for from your online footprint, so to speak. So, excited to get under way with that. Because we’ve got so many new people, as always, want to kick off by telling you just a little bit about Groove as we make our way through this. Everything is there on the screen for you of what we do. The bottom line is we’re a full service interaction agency with the sole goal of helping our clients make more money online. That’s the goal. That’s why we’re engaged. Whether you are an ecommerce company looking to increase the amount of products you are selling through your website or you are a lead generation company looking to generate more leads online, we work with you to generate more money online through that online presence. That’s what today’s webinar is really about—defining that we strategy. With that, I want to hand things off to Ethan to get started. Going to get going. This is an interactive session. Folks. We do this to determine how we can provide better content. So participate in the polls and send those questions in throughout the webinar today, because we’re going to have a Q&A session at the end. And so, with that, Ethan, I’ll let you take it away. Ethan: Speaking of polls, we have our very first question. We want to know why you are here today. So, if you could please take part in the poll, answer the questions. Let us know what your primary focus is with your online strategy. Are you an e-tailer? Are you a B2B or a B2C and trying to generate leads? Let us know why you are here today. That helps us to tailor the content for these webinars as we’re moving along. We’ll give it another second or two for everybody to vote. All right. That’s great. Lots of great information there today. So, why are we doing this webinar? People often ask: What’s the why? I can tell you, I was beyond frustrated here at Groove. As the CEO, we were investing over 700 hours a year producing content, and our overall traffic was flat. I was very frustrated and upset about this and wanted to figure out how could we reset and reboot our strategy? What were we doing wrong? We were definitely putting the work in, but we weren’t getting the desired results. Six months later we were climbing stairs. This is an example of our analytics and kind of seeing since we’ve begun this journey in July and where we are as of the end of January. You can see it’s basically like a stair step upwards along the way. So we’re climbing stairs and winning awards. This is a recent award we were very excited to be awarded by the Baltimore Business Journal as Best Business Blog of the year in their social media contest. So the hard work and determination that we had put in really turned around the desired results. I’m going to share a lot of information with you about the things that Groove did and how we’ve adapted inbound marketing strategies on behalf of our clients. It’s all about results, so feel free to ask questions. We’re a very open book in terms of the information we’re sharing. So submit those questions through the pane in the GoToMeeting application. So, today’s agenda. We’re going to talk about why inbound marketing? We’re going to talk about how customer behavior has changed. 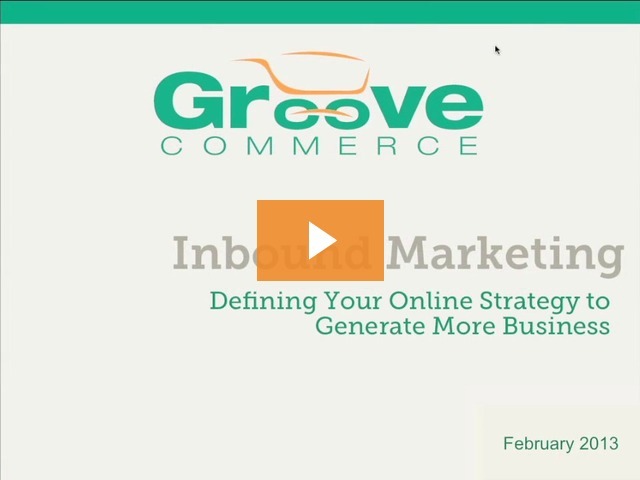 How does Groove think about inbound? It’s different. And then we’re going to talk about closing the loop and what I like to refer to as GPCT. And then, last, we’re going to leave plenty of time for your Q&A, so please get those questions in. We want to answer them. We’ll spend as much time as we can doing that. So, with that, let’s get started. So, blogging, Facebook, Twitter, Pinterest, LinkedIn—all the stuff you have to do, right? Everyone tells you: “Oh, you gotta be on Facebook! Oh, you gotta be on LinkedIn! Oh, you gotta be on Twitter!” But you’re not sure why, right? You’re just kind of creating these things and putting these profiles out there. But really, let’s break this down to why you should be doing this and then going on. There’s a great book, Simon Sinek, “Start With Why”. If you don’t have time to read the book, I’d encourage you to go watch the Ted video of his presentation. Most people know the what. Some even know how. But very few people know why we do things. That’s the type of thing that you need to spread within your organization. And you need to make sure that your inbound marketing agency is helping to spread that why to you and answering those questions. This is kind of Simon’s golden circle. You’ve got what, how, and why. And the best companies in the world are the ones that are answering the why—the Apple’s of the world, etc. So, really answering that is one of the first steps, because without that you are just kind of doing this activity that is just floating around. So, a lot of people ask, well, inbound marketing, but what is outbound marketing? That’s kind of what we call old school marketing; the communication is one way. Customers are sought out. You are going after them through print media, television ads, radio, trade shows, billboards, and cold calls—any of those types of things. You are kind of shouting one way at your customers. As a marketer, you are providing little to no value to the end user. You are just putting messages out at them. You rarely seek to entertain or educate your customers or your potential customers. So this marketing just kind of bounces off the wall and basically falls on the ground. So, outbound is a strategy of the past, and it’s changed. So we’ve talked about what is outbound. Well, what is inbound? Inbound is like a big magnet, right? Communication is interactive in two ways between your potential customer and you and your customers and you. The customers come to you. They come through things like search engines, referrals, Facebook, Twitter, LinkedIn, email, etc. You are communicating to them and they are communicating back with you through all these different mediums. You are providing value. You are answering questions and providing value along the way, and you are entertaining and educating. So, things like this webinar, we want to educate, but we also want to be a little bit entertaining. We don’t want you to poke your eyeballs out with a pencil. So we want to provide a lot of great content to you that you can learn from and be entertained by. We think that’s the successful message. That’s successful two-way communication where you are commenting and responding back to us, and we’re putting information out for you to consume. That’s what inbound marketing really boils down to be. So, how has customer behavior changed? AKA: they why. This is my mom. Luckily, she doesn’t know how to use GoToMeeting or GoToWbinar, so this picture is safe. But it all starts with mom. I got my mom a laptop a couple years ago. She said to me over the holidays, “Ever since you got me that laptop, the phone book goes right in the recycling bin,” meaning that her first thing is to go to Google. It used to be the days that we would have stacks of phonebooks stacked up in the cabinet for every county around us. That’s how we got the information that we consume. But now they go right in the recycle bin. She doesn’t even care about that anymore. And there is someone kind of at the far end of the spectrum that has changed very learned behavior that they have known for, basically, probably 50-60 years. That’s very interesting to look at. It’s very rare that you see behaviors like that change that quickly that are so engrained. Mack: And a Nintendo belt, apparently. Great. Ethan: Sorry, mom. I love you. A couple of interesting stats that I want to get into today. It’s very interesting information. 94% that the links search users click on are organic and not paid. We’re a big believer in paid search as well. We think it can lift organic clicks. But people are basically clicking on the organic results in Google. We’re seeing 79% of online shoppers, they are spending at least 50% of their shopping time researching the products that they want to buy online. That came from Power Reviews. But that’s a really interesting statistic. They are looking for what you are selling, and if your products are not optimized and they are not finding them, they are going to buy them through other sources. We saw a huge amount of shift in the retail space. We saw online have significant growth over the Christmas holiday. Yet, retail stores are having some of their worst orders and their stocks are getting pummeled. If you look at Kohl’s, and J.C. Penny, and other places, the online niches, each niche retailer and other folks are basically kind of growing, growing, growing. All of our clients are growing. But the offline is not growing. It’s going in reverse. So, a huge amount of online shoppers spending a large amount of time researching the product. 57% of businesses have acquired a customer through their blog. We can very much agree with that. We very much have acquired many customers through the content that we put out and the education that we provide. 67% of B2C companies and 41% of B2B companies have acquired a customer through Facebook. That statistic is a little bit old. And I see that growing consistently. We’ve also gotten clients through our social media channels. So, again, if you are not thinking about that as part of your overall strategy, you are definitely losing out on potential opportunities. With that, let’s launch into our next poll. What was your biggest challenge in 2012? Where are you lacking? Where do you think you are not executing very well. If you could answer that, we’ll leave that up there for a minute or two. Mack: Yeah, definitely one of the hot topics at Internet Retailer Web Design a couple weeks ago, talking to companies about 2012 goals: who hit them, who didn’t hit them, and, really, how you reassess for 2013. And the real question is, shockingly, a lot of people setting new goals, more aggressive goals, not necessarily a strategy to back that up, Ethan. So I think a common problem we probably saw in a lot of conversations. Ethan: Yeah, it killed me, basically, because I was on stage for two hours at Internet Retailer. I was doing live site reviews. I would ask people what their number one challenge was, what their goal was that they didn’t achieve in 2012. And they were like, “I don’t know. I don’t have goals.” I’m like, “Well that’s your problem.” It all begins with the proper goals. We’re going to leave that up here just for another second. Mack: It appears we have a statistical majority to close that one out. So, Ethan, some interesting data here for you. We’ve got a majority here saying, “I just don’t have enough traffic to my site.” And then the second piece, which we often see, is, “I’m actually getting traffic, but I’m not converting that traffic.” Some of the points you are hitting on already, I think. This is probably not a shock that this is the problem people are facing and some challenges. Ethan: Yeah, lots of great info. These things go in many different buckets. And the answers provided today are not unlike many of our customers when they come to us for the very first time and helping them to solve these problems. Let’s kind of get into what the overall elements of inbound marketing are. Here we are. I’ve kind of laid it out in a great and fancy little chart. But it’s everything from your blogging and content strategy—what kind of e-books are you making? What kind of buyer’s guides are you making if you are an e-tailer? Your PR, your SEO, your pay-per-click and your retargeting. Let’s not forget about the retargeting and display aspect of things. Your social media channel. Your conversion optimization and your email nurturing. So all of these things combined is what creates the spoke and the hub of inbound marketing. So, all things that you want to be looking at and then evaluating as you are going through this journey. The inbound sales funnel, right? We want to make sure that you get found at the top end through your Facebook, your blog, your Twitter, your LinkedIn, your Google, your YouTube channels. How are we going to drive people into that funnel? How are we going to convert them? If you are an e-tailer, we want to convert you into someone making a purchase on your site or someone signing up for your email marketing list or downloading a buyer’s guide. Don’t forget, as an e-tailer, there’s a lot of smaller conversion points where you can start to get that information about folks and track them and start to utilize your marketing techniques with them. Many people just kind of get blinders on and they think just about making the sale. Well, there’s a couple other smaller micro conversion points that you can get out there. And then the last stage in the funnel is analyzing. Do you have a tool, do you have a way to close the loop on all the stuff that you are doing and see where you are actually converting folks that come in from all of these mediums into customers and you are able to look at that revenue that they’ve generated for you? So those are kind of the three overall elements on that inbound sales funnel. If you want to break down the funnel, we talk about in kind of three steps. We have our top of the funnel or our TOFu. We have our middle of the funnel, or MOFu. And we have our bottom of the funnel, or BOFu. And at the top of the funnel it’s kind of very low impact things that people can do to engage with you. Maybe it’s reading your blog. Maybe it’s downloading an e-book or downloading a buyer’s guide that you have available. It’s finding you through your organic search. It’s pay-per-click. It’s kind of bringing them back through retargeting. It’s getting them in there via your social media. You’ve kind of got that middle of the funnel. That’s where your thinking about adding folks to your email lists, getting them into looking at conversion optimization, getting you kind of in the things you are in today. You are spending time. You are interested in learning more about inbound marketing, so you’ve set aside an hour of all of your very important days to come listen to us talk about inbound marketing. That would be considered probably a middle of the funnel activity. And then your bottom of the funnel, things like Google Analytics and HubSpot that allow you to track and analyze all of that information that you are getting in. It might be assessing people. It might be offers that convert into buyer’s. there’s a lot of different ways. And every business is different. And we want to look at the psychologies around how people buy within your industry and the types of things that you are selling. So, really, that funnel is very customized based upon every different industry that we look at and the size of the organization. Mack: Ethan, really quick on that, I think what’s interesting if our audience is saying not enough traffic, so, typically top of the funnel problems. Then we’ve got an audience that’s not indicating traffic as a leading problem, but rather conversion rate—middle of the funnel problems. And then people think, “Well, I look at analytics and HubSpot and things like that last,” but that information should actually help dictate a lot of what goes on in those top two layers. Ethan: Yeah. And I’m going to talk a lot more about goals further into the presentation. But it’s like Weight Watchers. You have to set a goal for yourself. If you go to Weight Watchers, you don’t set crazy goals. You set a goal of 10% body weight loss. Let’s kind of dig into the blogging, where we believe that frequency wins. This is a breakdown of percentage of bloggers who have acquired a customer through their blog. As you can see, the people that are blogging the most are acquiring the most customers. I think there’s ways to look at frequency, but this is a very, very interesting snapshot of 43% less than monthly. And it goes to 70% if you are looking at 2-3 times a week. So, those are some pretty significant numbers to look at. You definitely should be thinking about how much content you are putting out there, because, again, it does have that organic opportunity to rank and drive traffic. In terms of social media, you really want to think about how to connect with your most loyal customers and open up that two-way communication. Social is definitely a great channel for promotions and events. It increases the traffic to your site when you get those clicks. And then, as we’ve seen, there’s definitely been a shift away from things like links and anchor text over to more social triggers like how much your content is being liked and shared, how many people like your Facebook page, how many people follow you on Twitter, how much you are being re-tweeted. Those social signals are definitely driving SEO benefits. And so, it’s like if you have 100,000 on your email list but only 1,500 people that like your Facebook page, there’s a real disparity there and something that you should think about changing. How are you going to drive those folks and get yourself at least 10,000 Facebook visitors based upon the size of what your overall mailing list is? So, really kind of thinking about how you are going to communicate with those folks, how they are going to respond to you. It’s not just one way. You just don’t want to tweet. You want to listen for what they are tweeting back at you and respond and you’ll have great success with that. Next, it’s, again, a classic kind of middle and bottom of the funnel activity—the conversion rate optimization. How can changes in copy, layout, and usability affect your conversion rate? We’ve seen things like button color and button text have a significant impact. Things like site search results. How are you making it easy for your visitors to navigate? How are you appealing to the different types of shoppers and buyers? You’ve got spontaneous, competitive, methodical, and humanistic. Those are things that you want to be thinking about. And you want to always be moving. You want to keep customers moving from one stage of your funnel to the next. You always want to be moving them to that next stage. And so, really kind of thinking about your overall funnel as these micro conversion points that add up to one large macro conversion is very, very important. Again, for those of you that aren’t getting the right results on your conversion rate, a lot of things to think about here. And then it kinda comes down to analyzing your activities. This is an example screenshot from HubSpot where it allows us to track where folks are coming from, all different sources. We’re able to see the visits from each of those, the leads that come in from there. And a lead might be different based upon what your business is. It might be an email signup. It might be someone filling out the contact form. It might be somebody downloading a white paper. And then how those convert into customers and what your overall visit to customer conversion rate is. So being able to basically close the loop there is very important. And being able to see all your contacts in analytics in one place also becomes very, very powerful as you are working through your process. And, again, if you are a B2B company, being able to see the prospects, the organizations that are visiting your website and when they are doing it can be very powerful. So, say you are working with an organization. You have an RFP submitted, being able to see when they are on your site and the pages they are looking at. It can be very, very helpful from an overall tracking standpoint. Those are just some of the things that we’ve been able to glean out of the HubSpot reports that we pull. So, kind of bringing this all together, you want to close the loop around your contacts database. And one of the things, whether you are an lead generator, whether you are an e-tailer, a lot of folks just think of it as an email and blast out to everybody. It’s how are you going to tailor those messages based upon all the information that you know about them? Do you have a significant amount or your email list on Twitter? And based on that, how many of them have more than 100 followers? They might be very socially active folks that you want to figure out how to engage with very differently with different offers than folks who are kind of much, much broader and you don’t have enough information on. The people that are coming in from SEO, the people that are coming in through specific landing pages. Thinking about how you are nurturing and following up with folks. It might be a 3-4 email, or even a 7-email conversation where you are providing a little bit more information at each step of the way. So, folks are very, very overwhelmed with all the things going on these days, so you want to be able to contact and reach out to people through all these different channels to try to get a very consistent message to them. So, again, that’s kind of part of closing that loop. So that kinda takes us into the next piece here, where we love to talk about closing that loop. So the magic letters, GPCT. And no, I’m not talking about Jersey Shore, GTL. Mack: I was going to say, I think you have that wrong. Ethan: [laughs] I may, I may. I can never talk enough about Jersey Shore. But the magic letters are not GTL. It is Goal, Plan, Challenge, and Timeline. And it’s very important. You want to start with analyzing where you are in the process, doing a full assessment of yourself, auditing where you are and coming up with these goals, the plan behind the goal to achieve it, the challenges that you have to face, both internal and external, and what your timeline is. You can’t do everything tomorrow. It just doesn’t work like that. So, really documenting these goals at a very high level, creating a plan around them, a challenge, and a timeline is very, very important. Because, again, it’s like Weight Watchers. If you’re not doing it, then you’re not going to be able to get there. So, Weight Watchers, they typically tell you to say, “I want to lose 10% of my body weight” as your first goal. You may want to lose 30% of your body weight, but that’s way too much and way too challenging, and most people will just give up in the process. So kind of setting a very realistic goal for yourself to get to in order to really get corporate buy in on these things and to just really get excited about it yourself as a business owner or a director of ecommerce, or a director of marketing, like to get excited about it, you need to achieve goals in the process. So set some quick goals for yourself that you may achieve in a month, or two months, or three months. What are some goals you want to achieve in six months? And what are some 12 months goals for yourself? Very, very important. We walk people through an exercise with this and it tends to have great results. I want to share a couple of our goals that we had for 2012. It’s kind of very exciting for me as the CEO to be able to share those. So one of our goals was, as an organization of our size, as a boutique agency, our goal was to increase our monthly visitors to 7,500 plus on our website. So that was a goal that we achieved through the steps that we laid out. We wanted to get over 2,000 with our Facebook likes. We had a very kind of basic Facebook presence at the beginning of the year—less than 300 likes on our page. We pushed that to over 2,000. So that was a great goal that we were able to achieve and something that made me very excited. And I’ll tell you, as you achieve that critical mass, we’ve seen more and more activity, more and more social sharing, and it’s definitely helped us. That has definitely helped us to achieve our visitors goal. Our goal was to double our email list. Check. We wanted to create two new offers that we put out based upon the services that we offer. Check. We wanted to blog a minimum of once per week. Check. We wanted to tweet 20 times a week. Check. And we wanted to close a six figure deal from all of the effort that we’ve put in from this. Check. So, as you can see, earlier on I shared some of our analytics. We are kind of doing the right things in order to achieve the goals we want. You’ve got to put the time and effort into this to make it all work. So, some things to really consider when you are documenting these goals are figuring out what’s important to you. Is it things like increasing my monthly visitors? Is it increasing conversion rate? Increasing your email list? Increasing your social reach? Increasing your organic traffic, your sales, maybe sales in a particular category? There’s a whole lot of ways to break these goals down. And I would give yourself probably somewhere between five and 10 goals to achieve across the year and then create plans that roll up under this. And then, what are the challenges that you face to achieve them? Maybe it’s you don’t have the staff internally. Maybe you’ve got to get buy-in from a larger group of folks within your organization and move forward. Maybe you have to find the right agency to engage with that gets it. there’s a whole lot of ways to think about that. Maybe it’s going to cost money because we’ve got to pay for more paid search, etc. so those are the challenges and the timeline is how long is it going to take to get there? So these are definitely some goals that I want you to consider along the way. People ask us all the time about optimal frequencies. I shared a little bit about your frequencies. I’ll tell you that this year one of our goals is to blog twice a week. For a company, an organization, of our size and revenue and where we think and where we’ve seen results from our clients, we know we had to step up our own pace internally to meet the goals that we wanted to achieve. So how often does your audience want to hear from you? Generally, it’s one to three times a week unless you are really, really big. It’s really challenging. There’s so much noise to probably blog more than one to three times a week. Definitely a minimum once a week. Twice a week is great. Email, one to two times a month, again, depending upon the overall quality of what you’re doing and the content. Back in the day, one of the great SEO tricks was to create these very, very basic articles and submit them to all the article sites. And with Google Panda, all of that is gone away. That wasn’t quality content. That was quantity content. These days, quality content wins. Social. I would say 1+ per day. More is better as long as it’s relevant. On something like Facebook, probably a once a day update is great. Whereas, on Twitter, it’s much more kind of a stream of thought and you probably need to tweet five to seven times a day to catch your population, because they only kind of catch what’s happening right now. So you want to test these things and kind of see what your optimal frequency is, your optimal conversion rate. So the questions that I want you to really ask yourselves are: Have you defined your goals and strategy, your GPCT? Are you blogging enough? Are you engaging enough socially? Are you creating offers that convert? Are you nurturing your leads with email? And then, ultimately, are you closing the loop with traffic? Creating good content is very expensive. And I don’t mean expensive from a monetary standpoint all the time, but just from a time standpoint to invest the time and energy to get it done. So you want to have all of these things done right to make it work for you. A lot of stuff here that we just went through. Very, very important. I could speak on this topic probably for five days and focus on each one of those foundations for an entire day in the process. There’s a lot of stuff that needs to be done here to kind of wrap up your plan and move forward. So, with that I want to put an offer out there. I want to see how you think you are doing. We’ve got a great inbound marketing assessment that we’ve been doing with folks. We’d love to do it for you. So if you’d be interested in getting an inbound marketing assessment from us, if you could, just answer this poll here. Mack: Yeah, this is great. I think in terms of the assessments of you going through these before, this definitely gives you some great insight, as Ethan talked about, particularly those areas of where to consider starting to define your strategy. A lot of this can be overwhelming. And starting to channel some of that focus, really we’ve seen the inbound marketing assessments start to help with that. So I think in terms of looking for some actionable items, getting some good insight and feedback, and kind of grading yourself on where you’re at today, I think this is a great offer out there. I think it’s going to provide some interesting insight for people on the webinar. Ethan: Yeah. I mean we try to give away a lot of content to folks. And sometimes it’s taking that first step and engaging. I was just at the Internet Retailer Web Design show, which is a great show for e-tailers, a couple of weeks ago in Orlando. The challenges were very, very similar. Many people were overwhelmed by all of the options available out there, and they didn’t know which way to turn. There are so many available things these days and the marketplace is changing so quickly. Other folks had problems defining what their goals are. Everybody is kind of doing all of these different activities, but they’re not pulling it together under one specific goal and moving their effort forward and generating a great ROI from it. Inbound marketing is significantly cheaper to drive from a cost per lead or a cost per customer standpoint than the traditional outbound marketing efforts. So, with that, I think it’s time for a little Q&A. Mack: Absolutely. Ethan, a lot of great content there, so we’ve got some great questions. It looks like there’s some more coming in as I talk here, so I want to start on these. Real quick, as we enter Q&A, you’ve got the next webinar up there: How to make a successful move to Magento and boost your online revenue while doing so. People are looking to transition technologies. This is a can’t miss. And whether Magento is at the top of your list for technologies or somewhere in the middle, I think this webinar is going to give you a lot of valuable insight into not only how to make the move successfully but make sure you are answering the questions of why, which is, I think, a lot of what we got at today and a lot of what we’re going to get at here in even some of the Q&A. So, as we get into this, Ethan, one of the big questions…This came up from a couple different people here, so I’m combining some wording. But how do you start to put together an inbound marketing strategy relevant to your company? Obviously the assessment today is an interesting offer for people. But as you start to think about all those pieces that you put that define an inbound marketing strategy, how do people start to assess what they should be doing and where they should be spending time? Ethan: I think it’s very overwhelming. So the first thing you want to look at is the size of the organization. You want to look at the resources that you have available. The next step of that is what are your growth goals? Are you a company that just grows 5-7% every year? Are you a company that wants to grow 20-30%? Or are you an organization that’s on a fast track and wants to grow at 40-80%, 100% every year? Those kind of efforts will kind of be defined by the overall goals that you set. They need to kind of align with what your organizational structure is, your resources, and kind of your traditional patterns. We’ve seen many people shake the rust loose on their websites and move forward significantly. It is really defined by both the size of the company, the resources available, and the growth rate that you want to go at. Do you want to crawl, do you want to walk, or do you want to run? Mack: That actually ties into another question that came in just now. And maybe this is something you should definitely clarify, Ethan. You mentioned the frequency of which we’re doing certain activities. Is that you recommendation for everyone? Can you just hit on that real quick? Ethan: Absolutely not. Our frequency works for us in terms of growing our business. And we’ve grown anywhere between 30% and 70% every year that we’ve been in business. We have definitely put a pace in for certain things. And we also know where we want to go. So it’s not just where we are, but we have some significant growth goals for the future. So we know that we need to increase the frequency at which we’re communicating and creating that two-way channel. That is just kind of a ballpark standpoint. There’s definitely some baselines—blogging once a week, getting some tweets out, getting your Facebook updated. You want to build audience as well. If you only have 50 followers on your Twitter, don’t spend the time yet of tweeting 30 times a week because it’s going to be hard to build that following base, and only 30 people are really going to see it unless you’ve got very, very specific hashtagable content. It’s not a one size fits all. It’s something that needs to be looked at from a couple different factors. Mack: OK, great. This question here, we’ve got an e-tailer. They want to know, so you’ve got customers researching more and more online. How do I not only provide these resources, but if I engage them first, how do I keep them committed to buying from me? I think with what you hit on with the reviews and people are starting to look earlier, maybe before they’re ready to buy, how do you keep that engagement? Ethan: There’s a lot of different ways. It’s not just about getting the visitors to your site. It’s not just about the click, especially if you are doing paid search. You are spending a lot of money to get them there. So the first thing to think about is have you created an email welcome series? Do you have mobile popup on your site that encourages people to sign up for your email list? If you are a lead generation person and you do B2B or B2C lead gen, there’s certain offers that you could put there. If you are an e-tailer, it’s probably worth some type of discount or bonus on their first order to get them to sign up to your email list earlier in the funnel. Then once they’ve purchased, how are you following up with them? They’re not just going to remember you and come back to you unless you’ve done something really, really special. So think about the post-purchase follow-up. Are you emailing them 23-30 days post-shipping to come back and review the product? Are you emailing them after 60 days with a discount offer? Are you emailing them after 90 days? Are they buying a consumerable product and do you know the pace at which they consume? So if they are buying garbage bags and that box of bags is going to last for 60 days, you should start engaging with them at 45 days out when they are starting to think about the next step and rebuying. So there’s a lot of different ways there to keep that engagement going. And that can be very, very tailored based upon the industry and the result you are looking for. Mack: Great. Next question. This is always an interesting one. Timeline to benefits of an inbound marketing strategy. Ethan: I would probably say, realistically, to get this thing running on all eight cylinders is probably somewhere between five and nine months depending upon the efforts and resources put toward it. it’s not something that can happen overnight. It can have a great amount of results in the process, but really, you’ve got to get out there and do the basic blocking and tackling over and over again and you’ll start to see the results. There’s definitely some smaller micro goals that you can start to achieve results from faster. But to really get things moving upstream fast, it’s going to take you a good 5-9 months to really achieve the maximum amount of ROI from this. But once you get there, that momentum can build significantly. Mack: Great. Next question. This is an interesting one. Do I have to have HubSpot to have a successful inbound marketing strategy? Ethan: It’s a great tool. It works for lead generation. It also works for e-tailers. We’ve got a lot of insight around that. But it’s not required. But some type of tracking is. So, HubSpot is great because it allows you to cookie your visitors and see when they’ve come back and visit and build a history of all of their interactions with you and engagements, and you can build very specific workflows based upon that. But we have other tools that we utilize as well. Things like Listrak is very focused in the ecommerce community, too, and we love that tool, too. So there’s several different ways to do that. We think for the bang for the buck we really enjoy the HubSpot tool. And it definitely has simplified a lot of the noise in our process. Mack: OK, great. Another question here. In terms of defining a budget when it comes to inbound marketing strategy, how does a company go about doing that? Ethan: I would say $1 trillion. No, really, again, you want to look at what your margins are, what your sales cycle is. Are you closing a new customer every 30 days or is it a four month sales cycle to make it happen? What is your cost? The higher the price of the service the more it may cost in order to do that. I think everybody is a little bit different. I think even for our own paid search efforts we are looking for a cost per conversion of somewhere between $3,000 and $5,000. Whereas, if you are selling $150 product, that would probably need to be somewhere between $15 and $25 depending upon what your margins are. So it’s kind of there’s not a one size fits all there. But it’s something that you should map out, and you can, and you should look at and really kind of manage to those metrics. If you think it’s $15 an order, you want to manage your paid search and all your other activities to that. But it’s definitely not free. I will say that. Mack: Great. This is a common one we deal with in talking to companies, Ethan. How do you sell to upper management/leadership this idea that Facebooking and blogging can add value in an inbound marketing strategy? Ethan: It’s looking at what your competitors are doing. Look what people that you admire outside of your space are doing. It’s rare that we come upon a common these days that isn’t doing a little bit of AdWords, that isn’t doing a little bit of blogging or a little bit of Facebooking. If you are a pre-stage like that, that’s a very different conversation. But if you are spending money on all of these types of things, why aren’t you tracking it and engaging and building a strategy around it? It’s like, well, are you doing AdWords? Yes. Are you doing LinkedIn advertising? Yes. Are you blogging? Yes. Are you tweeting? Yes. Are you doing Facebook? Yes. Are you tracking it? No. Why not? It’s a very, very easy question to ask and answer, because if you are already putting resources out there, it definitely is something that you should be doing to take that next step with. So, that’s an easier sell to middle management or upper management. But if you are at the beginning stages of it, that’s a very, very different conversation. It’s looking at what your website traffic is and where you are going from the next steps. Mack: OK, great. Next question: I’ve got a blog. I’m blogging a lot, but it’s not getting the traffic I’m looking for or the conversions. I don’t want to keep writing if nobody is going to read or convert off of it. what do I do? Ethan: Are you doing the right things? Are you targeting the right keywords? Are you using the right vernacular that your customers are using? Are you talking about things in a way that only your organization does? There’s so many things that can be done there, and just aligning your blogging strategy to what the customer’s expectations are can basically shake the rust off of it. are you optimizing your posts? Are you sharing your posts socially? There’s a lot of things there that have happened. Again, going back to our experience, there’s things where we’ve had a blog post on the fifth or sixth page of Google and you get 10 or 15 Google +’s of that. We’ve seen those move up to the first page. So are you doing the right things there? Sometimes it just takes having a good coach in that process to get through it. Mack: Here’s a great one. We unfortunately deal with this one a lot. It’s an unfortunate situation. So I don’t have tracking an analytics set up. How do I start to set goals with very little data? Ethan: Again, that’s always a challenge; sometimes a shot in the dark. I think if you don’t have tracking and analytics that’s the first step. I think defining those goals, at least some preliminary ones, like people definitely usually have some gut feelings. You’ve got to feel your way through that one a little bit and then readjust. I will tell you, there’s no goal set in stone. The markets change. New opportunities arise. You want to be able to move and shake with the marketplace. It seems like every three to six months there’s something new that comes out in the online space. Maybe you want to shift a little away from one goal to attack a new or smaller goal. So you need to be a little bit flexible and fluid with that. Mack: This next question has come up in a couple different ways but all similar themes. This idea of cost relative to investing in content, whether that be video content, blogging content, is it better to get stuff out there cheap or is it worth the frequency if you have to invest more in this quality content? The question seems to pertain back to cost versus putting out content. Ethan: I think that there’s a couple of levels of content. There are things that are definitely…good is better than great sometimes. Getting content out in a timely fashion so you don’t miss the window, doing things with a flip-cam or an iPhone, you can get some great high-def video. Maybe the sound isn’t great, but there’s things that you can do about that. Getting some content out there on a basic level are great. Having some more polished content that’s at the upper end is great as well. You don’t want to portray yourself as something that’s an upper-end piece of content if it’s very, very basic. But there, I think, wombs to have all different types of that content available. So depending upon what your business is, you might want some highly produced video of the organization. But you also may want to just do some real basic video blogs. So they kind of both can live there at the same time. Mack: The next question: How do you aggressively build a social media audience without disengaging the audience you already have? Ethan: People often ask, “Well, should we just tweet this once?” I can tell you, most people aren’t getting it. Are you evergreening your content? If you’ve got really good, solid blog posts that you’ve written, I would be promoting those blog posts via Facebook and Twitter, especially via Twitter. You will see us tweet some of the same content out over and over, changing the creative around it. but every time we do that, people click on those links. I think there’s so much noise out there now that you’ve got to put a decent amount of content out. And why not repeat the things that you are doing? I think that it takes a lot of time and effort to create some of the quality content that you are creating. Why not tell more people about it? Mack: So along the lines of social, can you speak to the idea of these promoted ads, whether it’s Twitter advertising now or promoted ads on Facebook? Ethan: I think if they are done the right way they can be very beneficial. They’re not inexpensive like back in the old days of GoTo and a penny a click. But they can be very worthwhile. They can help, again, to build your audience. I’m probably more a fan of the Facebook based upon the demographics and the way that you can slice down your audience. Probably haven’t pushed as much in the Twitter area. I’m OK with the ads on Facebook, probably not as OK with them on Twitter. I’ve never click on a Twitter ad. But I’ve definitely clicked and bought personally off of Facebook advertising. Mack: There you go, folks. If you want to sell to Ethan, don’t do it through Twitter. Do it through Facebook. Ethan, favorite question you always get asked. This came up in Orlando a couple weeks ago and now here. We’re chasing a particular conversion rate. What’s the right conversion rate for us? Mack: In terms of it, it is a question that comes up. So, Ethan, I guess can you speak to how we try and help frame conversion rates from client to client and expectation management? Ethan: I definitely think setting some goals around your conversion rate are good. Conversion rate is different for every single industry. It’s different upon if you have consumable products. It’s different if you have a lot of returning customers. It’s different. I’ve never met someone that couldn’t improve their conversion rate. Ever, ever, ever in the last 15 years never met someone that couldn’t still improve their conversion rate and do better. So, I think you’re not going to double your conversion rate unless something is really messed up with your website. How do you stack a whole bunch of things together and drive it upwards? Ethan: We see this a lot. You’ve got a bunch of different divisions and a bunch of different products that you offer. Everybody wants to have 10 pages on the website about their content. I would tell you that most people don’t necessarily read online. They like to skim. So, sometimes simplifying the message and making to really simple allows you to have a very focused call to action, especially if you are not specifically selling online. If you are in a lead generation space, simplifying the message and starting the conversation sooner gets that going. For us, we want somebody to sign up for our email list. We want to meet them at an event. We want them to read a blog and leave a comment at the bottom. We want them to share our content. We want them to sign up, based upon enjoying our blog, for our email list. I think the sooner that you can start that engagement the better it’s going to be for you. I would say if there are pages on your site…We went through this process ourselves. We’re turning six years old. We’ve been blogging for six years. We had a ton of content out there and we had a couple hundred pages that no one really looked at or maybe looked at once or twice across an entire year. And so, Google was grading the site on quality. It used to be, back in the day, that you could optimize a title tag, put an H1 tag and a little bit of junky content on a page and start to rank for some tail term. Well, now Google is able to grade and look at the overall quality of your site. So the bigger the footprint of the site is, the more diluted your quality content pages are going to be. For ourselves, I think we eliminated about 250 blogs that just were low-hanging blogs that really maybe were old. Does anybody really care about the release of Chrome that we blogged about when it came out years ago? Well, unless you are Google you probably don’t. So, eliminating some low quality, low traffic pages like that has also helped to kind of shrink the funnel that we’re looking at. So, thinking about that content plan and that site architecture is really important. Mack: A couple more questions here, Ethan. You covered a lot of the dos today when it comes to inbound marketing. Any don’ts that you want to give the audience? Ethan: Don’t shout at people. Don’t be one way. Don’t go crazy. People will tend to put out just too much content too fast. Really think about your audience. Speak in their language. Don’t speak above them or below them. Those are definitely some of the don’ts. And don’t expect overnight results. Mack: Here’s another good one for you. This is actually a common question around social media for some of our clients. The idea of your own self content versus sharing that of others or things that you think your audience might find interesting. At what point do you balance that line of a resource for that engaged audience versus also just being a source of information? Ethan: I think that there’s value in providing. You’ve got to create content. There’s definitely some folks online that are just basically curators of that content and don’t come up with anything new. I think there is a balance. I think the more that you share other folks’ content, people in your industry, the more they are going to retweet you and share your content, so there’s definitely some great sharing there. I think it’s kinda both. I think it is putting out content on your own and I think it is sharing folks’. For everything you put out about yourself you might want to put three, four, five things about the industry. I think it’s finding that balance and seeing what works for you. Mack: Great. Ethan, I’m going to go ahead and apologize to our audience because there’s no way we’re going to cover all the questions that were submitted today. With that, want to wrap up with some closing thoughts. Before we do, again, just want to tell everybody we’re back next month, Thursday, March 28th, 2-3PM EST: How to make a successful move to Magento where you can actually boost your online revenue. This is great for anyone thinking about transitioning technology in the next 3-12 months and, I think, some of the key pieces to evaluate and key things to consider while you go out and look for a partner. I think it will be a lot of great content in that webinar. Ethan: Yeah. 100,000 e-tailers can’t be wrong. So, looking at the platform and the toolbox it provides you to boost your online revenue. It’s definitely going to be a great webinar. Looking forward to doing it. I also want to say if anybody is interested in the inbound marketing assessment and they didn’t answer the poll, please feel free to give us a call: 800-564-9260, or email us: info@groovecommerce.com and we’ll get you scheduled and get you in the process. Mack: So, Ethan, real quick, closing thought today for the audience? Ethan: I want to thank everybody for coming out. I really think that you should be thinking heavily about your inbound marketing strategy. Again, I can’t stress enough that versus outbound it’s significantly cheaper to acquire new leads and new customers along that process. Inbound marketing works for both ecommerce and lead generation. I think there are a lot of best practices that a lot of people that we assess are not doing. Mack: Great. Ethan, as always, thank you. An awesome hour of content. And I think the audience agrees. A lot of great feedback already. We appreciate that feedback, folks, along with the questions. Again, if we didn't answer your question, like Ethan said, send an email, hit us with a tweet, get us on Facebook. We are happy to engage and answer the rest of those questions. A lot of great content today. More great content coming up next month. This concept of inbound marketing, like Ethan said, we are having this conversation every day with people. People are trying to figure out how to maximize the performance of their online presence. And I can tell you that this is where it starts. The hub of it is this concept of inbound marketing. So, happy and looking forward to having this conversation with anyone that expressed interest today. And hopefully, those that haven’t expressed interest yet will. Want to thank you, as always, for joining us, folks. This webinar series is worthwhile to do because attend. We know you are all busy and appreciate you taking time out of your day to join us. We look forward to having you back again. Look forward to engaging with all of you online in the Groove Commerce world. Thank you. Have a fantastic day and we’ll see you next time. Thanks.